Vitamin D3 2000 IU is rated 4.8 out of 5 by 48. Rated 5 out of 5 by Lucy from Love the product Love that it is a Tiny gel pill and easy to swallow. I rather take a gel pill then a capsules any day. My vitamin D is in a good range when I was stuck in the winter in the house and no sunshine so I highly recommend the Vitamin D3. 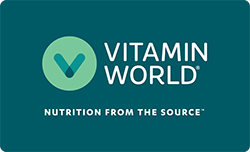 Our Vitamin World store has closed up so I have to do all my ordering on line now. Miss going into the store and seeing what they have. Rated 5 out of 5 by Anonymous from Good product Vitamin D is important. Thank you. Rated 5 out of 5 by Anonymous from Excellent product Excellent product and the store Services. Rated 5 out of 5 by Enrique from Highly recommend this Product. If Ur not out in the sun a lot this is the Vitamin for you, 2 of this in the morning everyday you’re Good to Go! Rated 5 out of 5 by Taty13 from Excellent product Easy to swallow, perfect! Rated 5 out of 5 by TallQueen from Excellent Product One pill after dinner is all I need. Rated 5 out of 5 by ROBERT from excellent but one problem. It is great except that all of the capsules are stuck together and it takes a considerable effort to get one broken apart from the glob of pills.